The Yad L'Isha Legal Aid Center has joined forces with The Ruth and Emanuel Rackman Center for the Advancement of the Status of Women, a part of the law faculty of Bar Ilan University, to publish "HaDin VeHadayan" - the Law and it's Decisor. 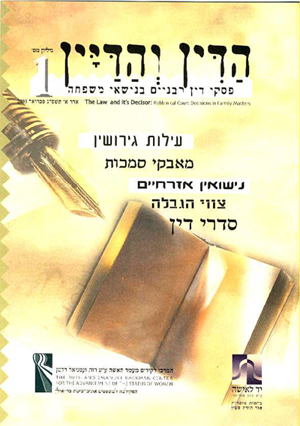 The first pamphlet was published in February 2003, and contains summaries of cases and rabbinical court decisions in family matters. The booklets offer crucial, previously unavailable insights into the policies and judgments of the rabbinical courts. In the introduction, Susan Weiss explains that the importance of this project is twofold. From a professional, legal perspective, these cases are now being made available to all lawyers and judges involved in family law. In addition, the publication of rabbinical court decisions and deliberations will contribute to an increased public awareness of both the problems and potential solutions, while serving as an internal review mechanism. If you would like to receive a copy of the booklet email ots@ohrtorahstone.org.il with the word "booklet" in the subject.